Boy, what a week I have had...just since Friday! Painted with my niece/hubby for 3 days getting their basement sheet rock done. We still have the trim work, but that will wait a few days. She had to pick a wall color for the bathroom.There is a baby shower this Saturday, so Tracy (Dear SIL) and I decided to clean the house for her. We went over Monday (after all that painting) and did the kitchen, baths, bedrooms, living room...and were too tired to finish the floors. So, this morning we went back and scrubbed both bathroom floors (on my knees) the mopped, vacuumed the carpet and rugs, and steamed the hardwood living room and kitchen. I am so sore...I can hardly move! 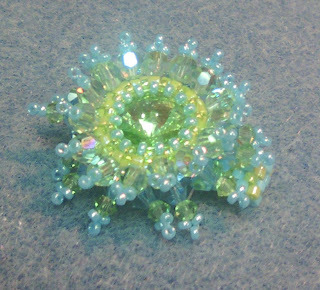 In the evening, I've been sewing on bullions for little roses. 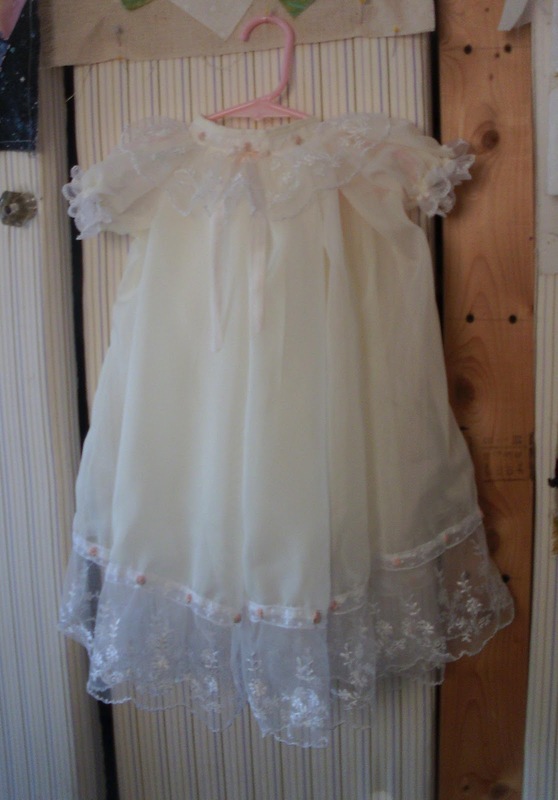 This little dress will be my Mother's gift to the niece...for her first little girl...go with her already three rough'n'tumble boys. The dress is a bishop style made of chiffon. 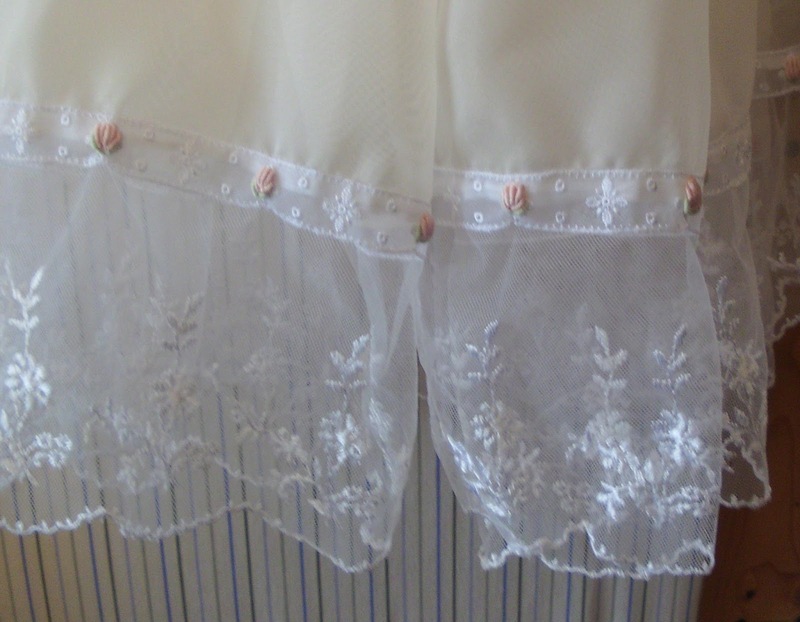 It has French seams and lace trim adorned with bullion roses.Now, I'm working on a little slip to go under that. 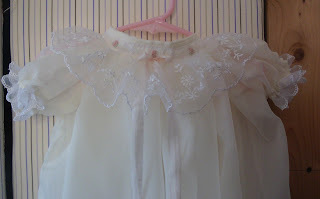 Wish you could see the dress for real..it is so feminine and looks like a cloud. Continuing sewing the cutest (okay maybe not THE cutest..but still darn cute!) little baby clothes this week. 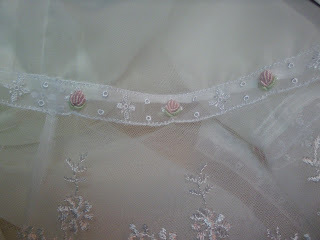 I have the last dress constructed but am adding bullion roses to the lace. When it's all done I'll post a pic of the outfit. Still need to stitch the under slip...which is cut out and on the table waiting patiently.But, before that...am helping my niece and her hubby to paint their newly finished basement. With 3 little boys, and now a new sister almost here...it was time to get this done. So, painter by day and seamstress by night! 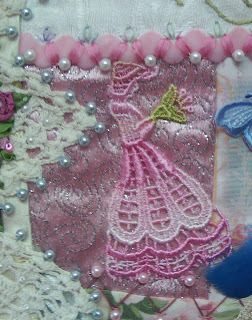 At least for about 3 more days...Right now...waiting for them to come and get their "helper" for another afternoon of painting fun!So, thought ya'll might like to see what an IMPACT simple little bullion rosebuds have on this lace trim.If you have not tried bullions...seriously, once you get the hang of them, they are so fast and easy. The trick? Find a needle that is long and lean...the eye should be the same width as the shaft. Straw needles and milliners needles are ideal. However, I work with perle cotton...and it's near impossible to find these needles in large enough sizes to get the perle cotton through the eye. So, I use doll needles and any needle (regardless of the name) that I find that fits the criteria of SAME SIZE SHAFT AS EYE. This type of needle glides through the "thread wraps" that you create during the stitch process...and don't get "caught" when the eye gets pulled through the wraps. 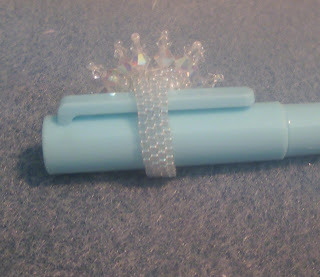 So, my soapbox for today is...if you are having trouble doing bullion roses....It is NOT because they are hard...It is NOT because you are a doe-doe brain...It is because the needle you choose is the wrong one for the job. Try again! Seriously, they are easy...if they weren't...I would not be wasting my time by doing so many on this little dress. Really, I wouldn't! Here's a little bullion rose tutorial for you...on a 4-hole button. You just won't believe how cute these are! This one is only about 1/4 inch in size...so hard to photograph...sorry you can't appreciate just how cute it really is by this pic. But, you'll agree for sure once you have tried it...just grab a four hole button and a scrap of fabric to try this out!First...start by securing the button down with regular sewing thread. 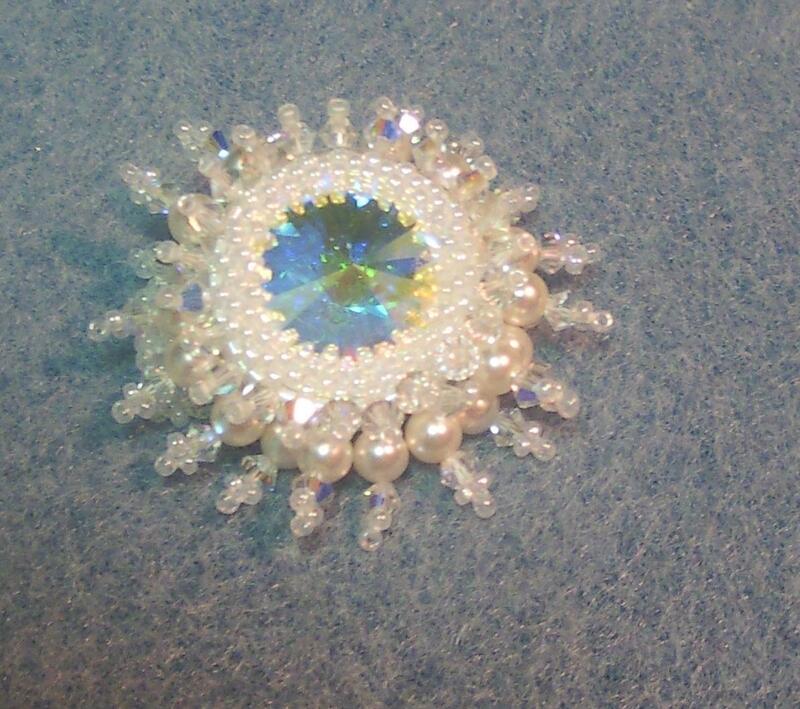 You want to rotate the button so that the holes form a diamond and not a square; and secure by stitching vertical and horizontally at least twice...then anchor your sewing thread to the back. 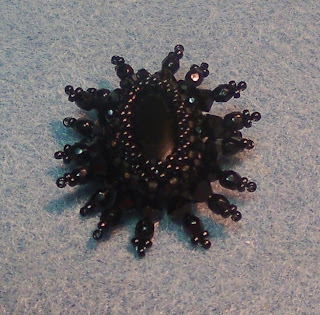 Change to embroidery thread and a slender needle without a large eye...as it has to pass through the wholes a couple of times. 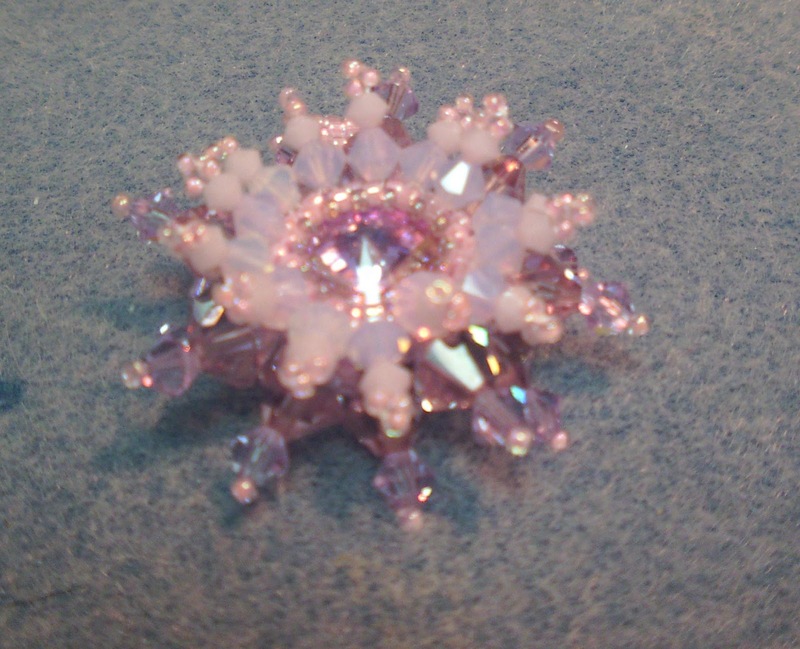 Next, you start by stitching one bullion of the rose bud color (pink shown in the chart below) using the top and bottom (A & B) holes. You have to use the "poke and pull" method since you can not needle through the hard button. Just needle up at "A"; needle down at "B" but do not pull the thread all the way through...needle back up at "A"...hold the needle straight and wrap the thread starting at the base about eight times around the needle. 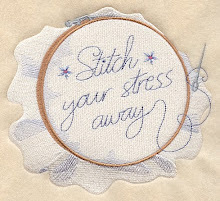 Now, pinch those wraps between your fingers and pull the needle. This will bring the remainder of your thread through those wraps. Pull downwards and the wraps will begin to tighten up, you can also "nudge" them into place with the needle at this stage by pushing on them slightly...while pulling the thread. Lastly, needle down again at "B" to hold the bullion in place. Stitch two more bullions in this vertical position with the "pink" embroidery floss. 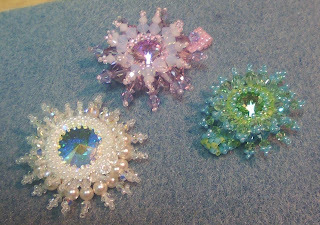 I used silk floss and two strands for these little buttons...you'll have to adjust as needed based on the size of your button and your floss. Then stitch the green bullions in the same manner but using the "side" holes as shown in this chart as your "A" and the "B" position remains the same...the bottom hole. 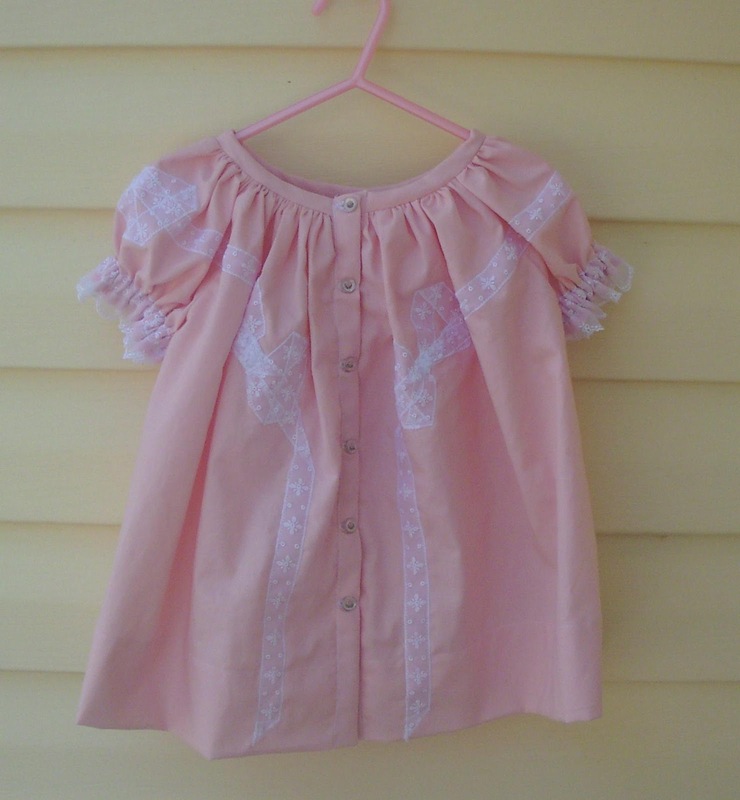 I had great fun yesterday creating this little blouse for my new niece...we are awaiting her arrival. The fabric was thicker than the pattern called for...making the neck opening larger than designed. So, instead of a Bishop Style Dress for a six month old...it became a Bishop Style Blouse for a twelve month old. Luckily this was an easy fix to just enlarge the sleeve openings by using longer elastic. 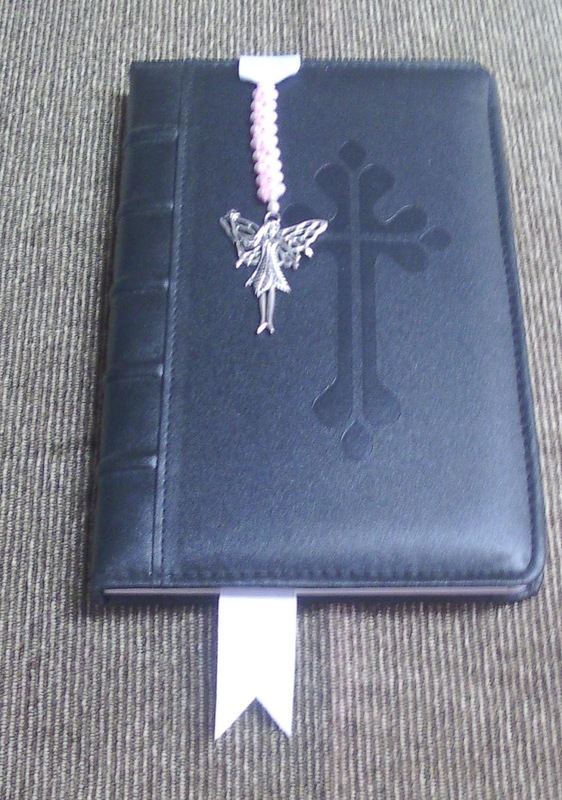 Bishop style types are very forgiving...and my muse loves to "adapt and over come! ".Next, I'm off to find some thinner fabric to try this again in the correct size. 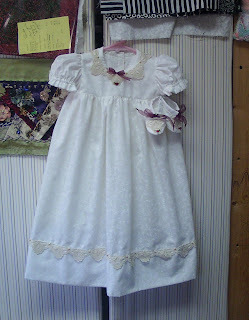 And, I want to make it longer for more of a christening style gown. We'll see how that comes out. 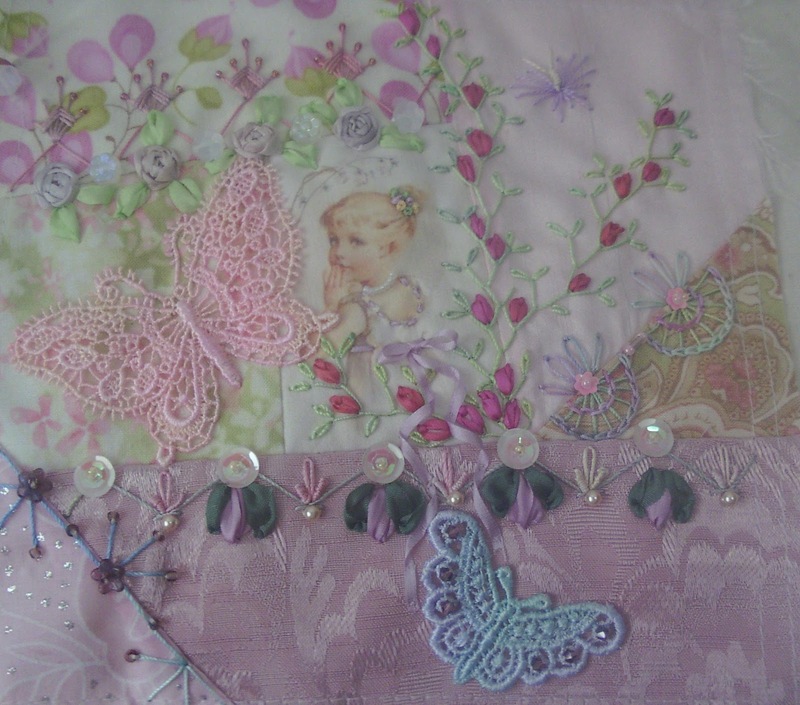 I'm having a great time stitching baby clothes and such....but am getting more behind with my "monthly" projects...so it will be a race to see if my muse can catch up! Hugs to all! Here's my block for the month of May. 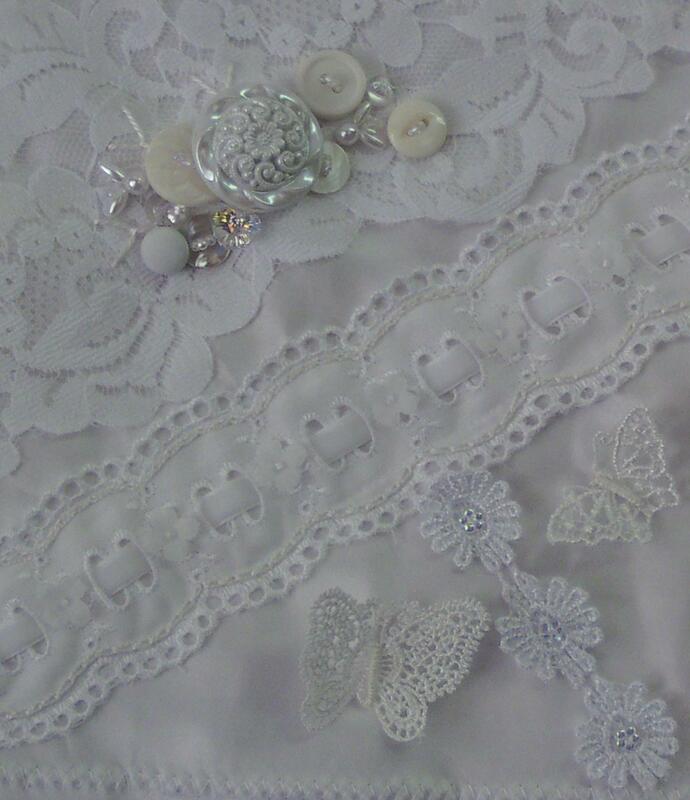 Working in only white is difficult for me; and I wish that I had not put all the laces and trims on at the beginning of the year. Now, I'm kinda locked in on what to do.But, I did figure out a "plan" for my blocks...other than a white wall-hanging...but will have to try it out with some of these first five blocks to see if it works. Sometimes my mind had great ideas...that my hands can not create! Ha! 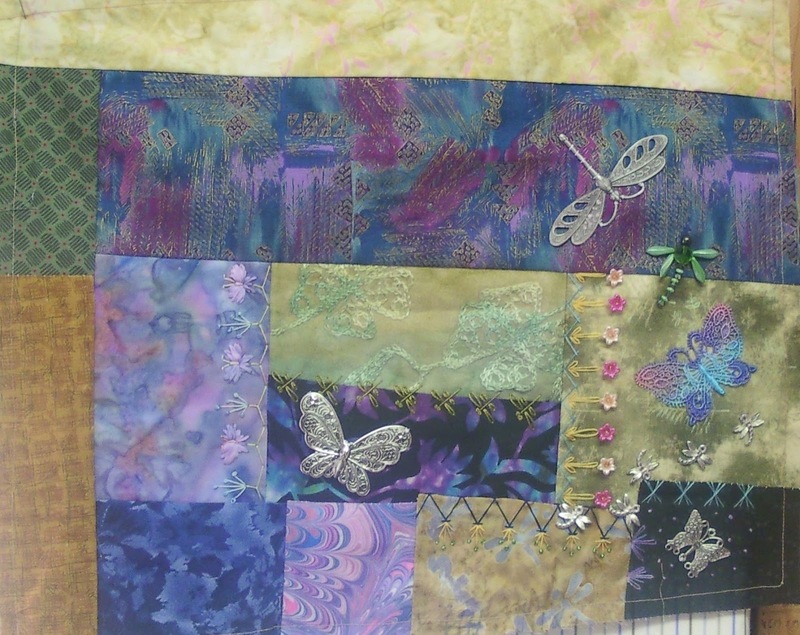 Linear style blocks, pieced of squares and rectangles are not my favorite type of crazy quilt patchwork...as I find them extremely boring. 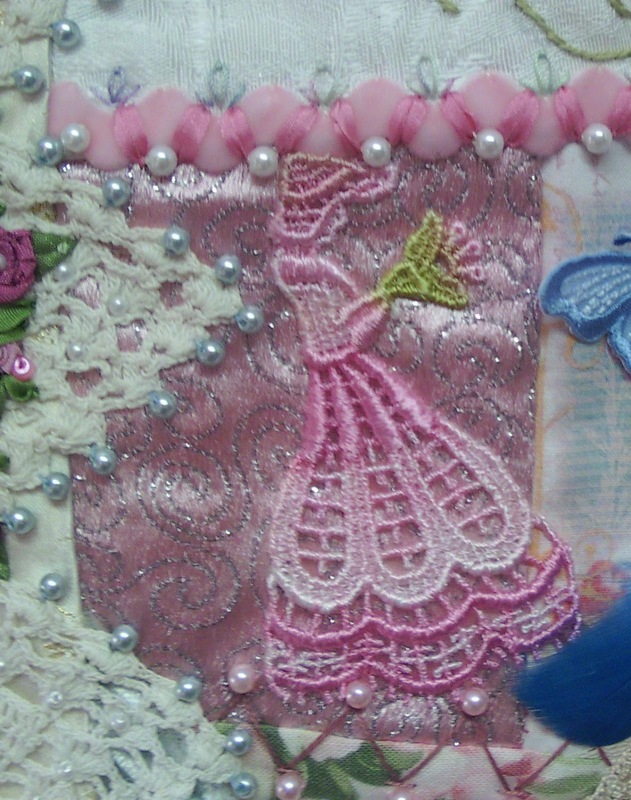 And, this block did not catch my muse's attention at all. Luckily, the theme was dragonflies and butterflies...so two seams came immediately to mind for that. 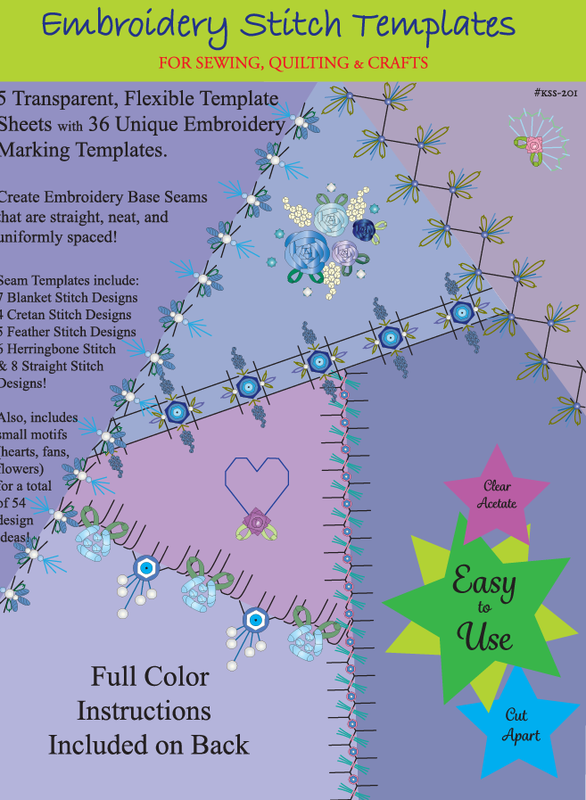 This little butterfly seam is created with my templates, which I use all the time! 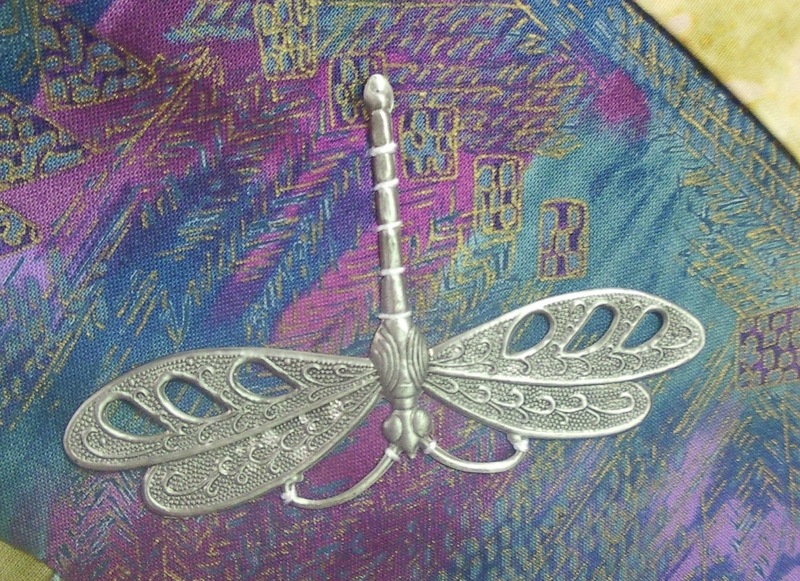 And this little dragonfly seam is #22 in my book, Embellishing Crazy Quilts. Since Meg stated that she was more "steam-punk" than Victorian...I included two large pendant style charms from Fire Mountain Gems...a dragonfly and a butterfly.Hopefully, the other ladies in the group will enjoy this block more than I did.It will go into the mail on Monday. 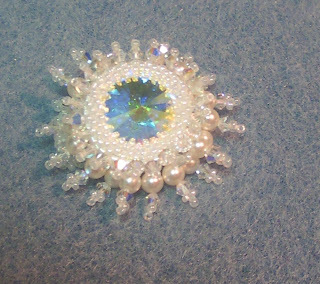 I am the last person in the Round Robin to work on Nicki's block for Lace and Pearls. 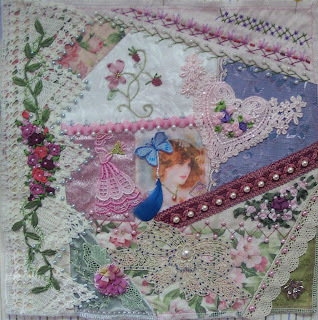 When it came to me, I felt that it had plenty of pearls...but needed more lace.So, I started by adding a lovely piece received from The Netherlands...a parasol lady. 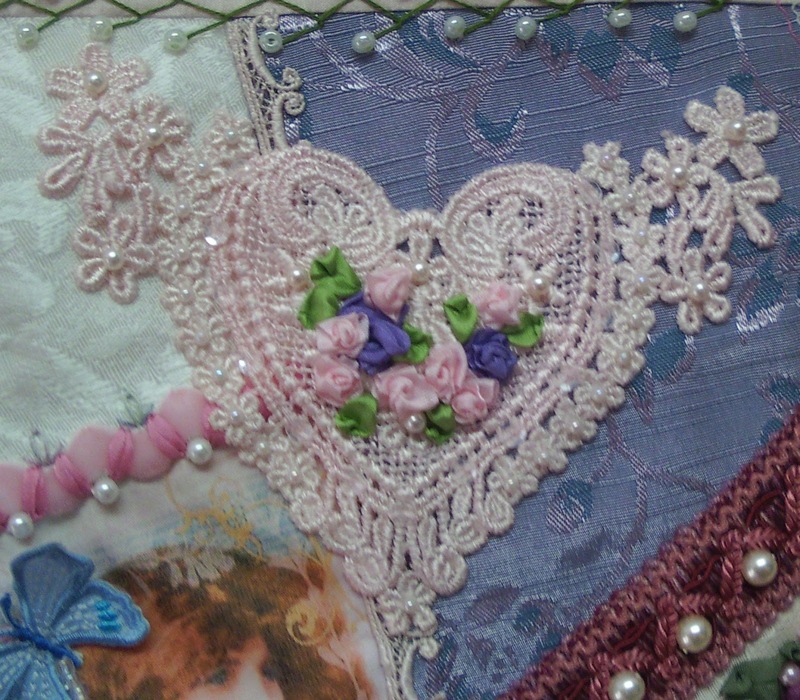 At the top of this lace, I added a velvet rickrack seam treatment with some pearls and silk threads.Lastly, a lovely lace heart sent to me by Annamaria of Romania...a dear and generous cyber friend. 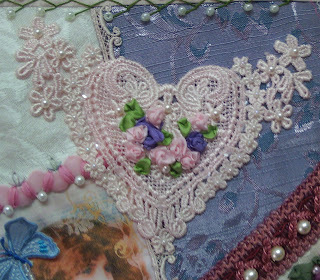 Some simple roses were added to the center of the heart, enough to draw some color from other areas of the block, but not too much to over-shadow the lovely lace.Hope you enjoy the photos...and I'm sure Nicki will love all the lace! I just spent two hours moving my desk (15 minutes), re-routing all of the cords (10 minutes)...and trying to get my large monitor to talk to my laptop and be visible as my main monitor (1 hour and 35 frustrating minutes). Geez, it should be simple...now, I just want to go take a nap! Technology is wonderful...and horrible at the same time! My eyes were getting so tired from viewing the laptop monitor that I decided to move my desktop flat-screen monitor over to the desk so I could use it most often. It does help, and that means that I can do more writing as I need to so badly. Now, to go and move one of the old dinosaur monitors from the garage back upstairs...so the desktop will work. Mostly, we play Clifford the Big Red Dog on it...so that does not need a flat-screen style. With summer on top of us...Aidan will want to do her own "office work". I think I shall teach her to type this summer...ffff jjjj ffff jjjj...wish me luck. Not bad for 8-years old! 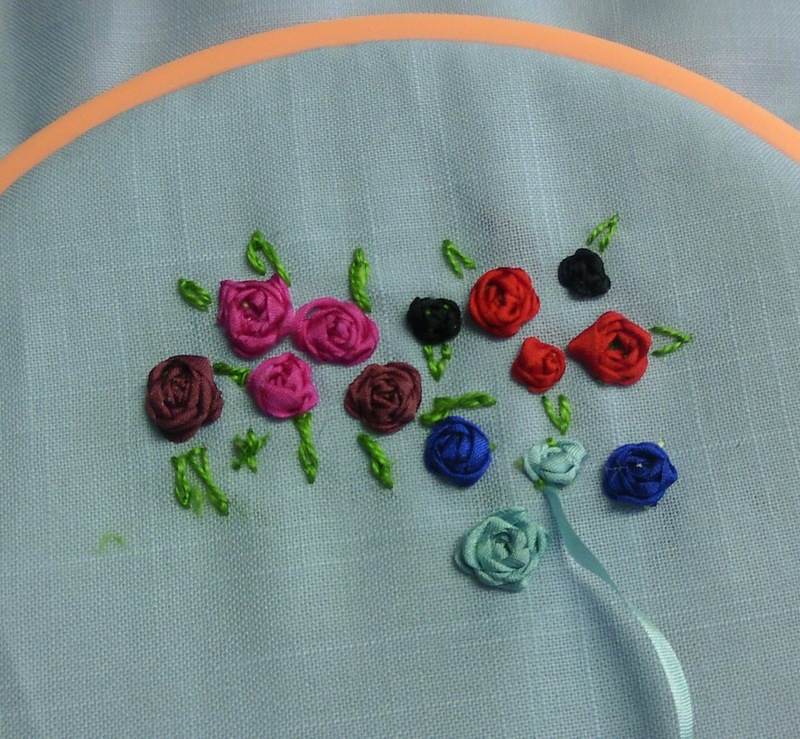 And, I'm no longer having to stitch the "spokes" for her...she is doing the roses and the leaves ALL BY HERSELF! I'm one proud Nana! Both of my nieces are expecting. And, they are sisters...so that's even more fun! The eldest is having a girl...her first after two boys. And the youngest is having a boy...her first child. We have the first baby shower in two weeks...so this weekend, I've been busy! And, still loads to do...but here is the first little dress to get completed, with matching booties. 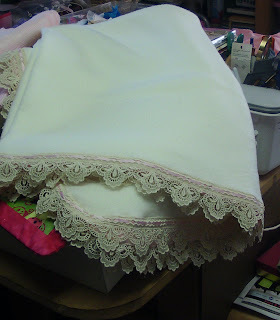 And a fleece blanket with lace trimmed in pink silk ribbon.No time to talk...have to get back at it. Finished up my part of Meg's block in the "Wine" crazy quilt round robin over on Crazy Quilting International this past week, but forgot to post. Life has been nuts!The ladies did a great job of filling up the space, but the center of the block needed a motif and here's my seam work. 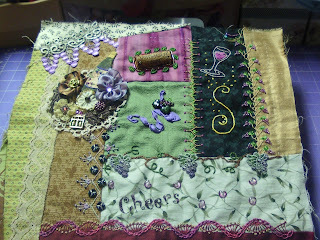 Here is the whole block...as it will get mailed to Meg in the next couple of days. And the winner is.... Val! 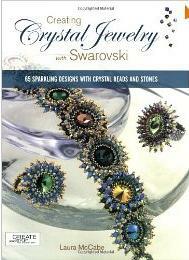 Val has won the drawing for the book...Creating Crystal Jewelry with Swarovski by Laura McCabe. 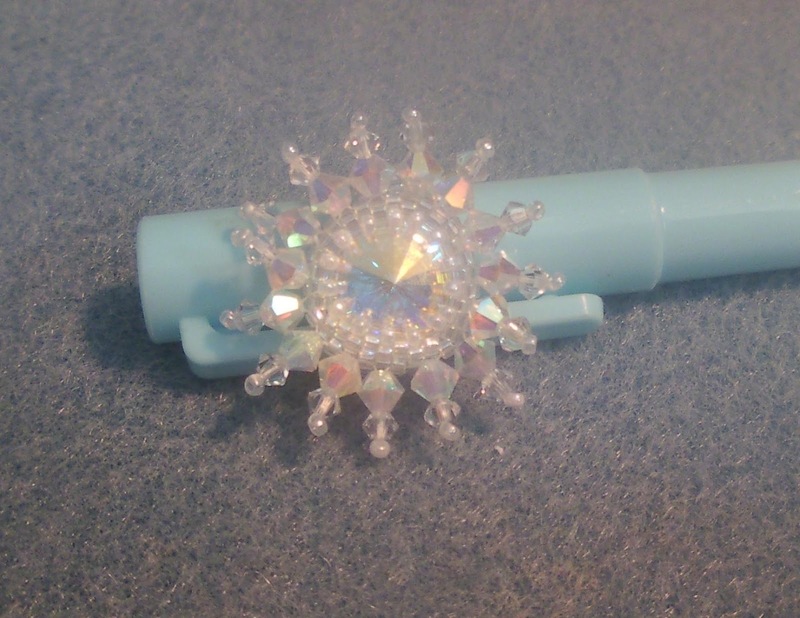 I highly recommend it as a good buy for all!Here was Val's comment: "A beaded rivoli a month sounds like fun! 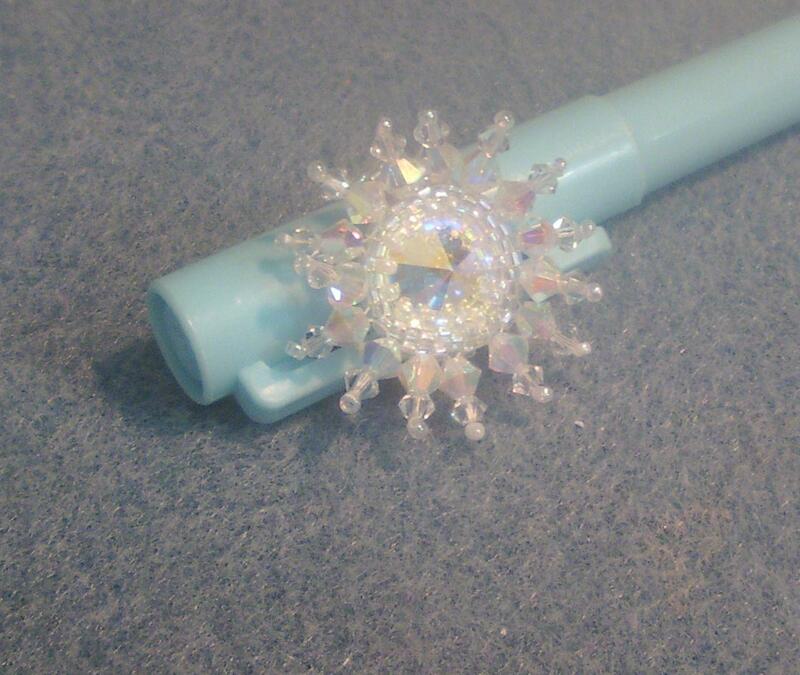 The cabochons are lovely. The white with the pearls look bridal, and the purplish-pink is sweet. Oh, a book draw? Please count me in. I love doing these little projects when I have the time and inspiration too. "Congrats Val...and thanks to all left comments. Wishing y'all better luck next time!Hugs! A new little beading class will be offered over at Maureens Vintage Acquisitions today...a beaded bookmark. Just click on the Take-it-Anytime button tomorrow and you will find it. However, it is so much MORE than just that. This technique makes lovely beaded trim...that can be made to an an exact length. 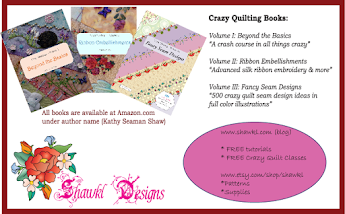 I like to use it to cover the rim of band boxes and tins after the top has been done in crazy quilt fashion or embroidery and lace. 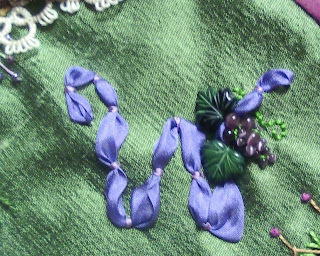 Or, use it in garment construction too!...as a lovely trim to cufs or pockets!But, it doesn't just stop at trim...it can be a piece of jewelry! 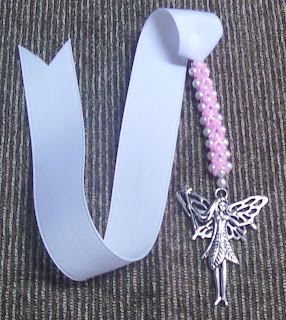 Add a clasp to the ends and you have a bracelet...a little longer and you have a necklace.Attaching a charm to one end and grosgrain ribbon to the other makes a bookmark. These are super gifts for teachers...and it only takes about two hours (or less) to complete the project...so several can be made!Hope you will consider taking the class...it is VERY reasonably priced...and available any time.I'm always here to answer any questions...but have also spend hours drawing the charts and creating the narrative to explain just how to make the bookmark...so you would be fine just on your own as well I'm sure! This is a round robin block for a swap over on HGTV Message Board. I'm thinking of changing out one of the ribbons...because it seems too dark in the photo. Camera shots have a way of showing you things that just are not so clear when you are looking right at an object.The swap is a set of 6-inch blocks...with each person doing one block. So, this block will travel to the next person in the group...and she will add her own block to the set...before sending them on to the next person.If you want to create crazy quilt blocks...jump into a "newbie" or "beginner" swap...the best place for that is over at Yahoo Groups...Crazy Quilting International...in my humble opinion. CQ for Newbies is another great group to consider too! I belong to both...and many more. 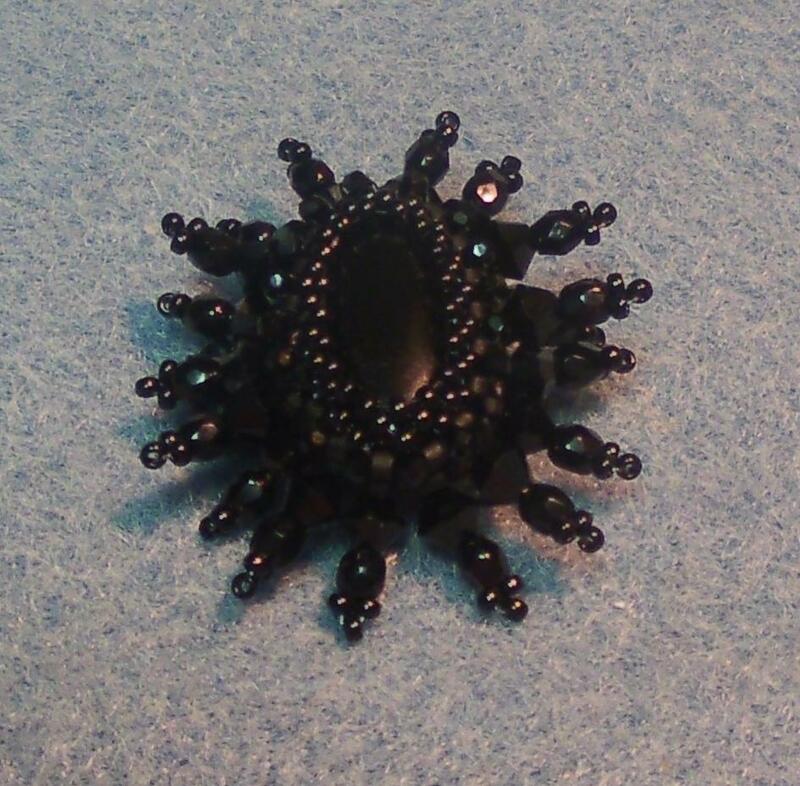 Here ya go Ms Eileene...a black oval cabochon turned into a beautiful ring...you should be all set when rings GF! 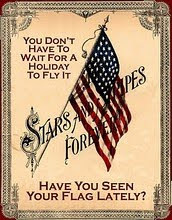 Ya'll don't miss out on the current give-a-way...so read the last post! 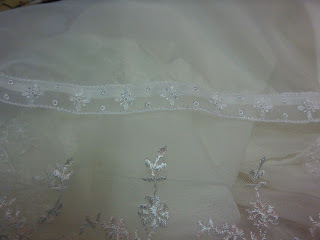 I'm in love with beading rivoli's now! Thanks Eileene!And, I've decided to change my idea for the Beaded Journal Project this year to a beaded rivoli project each month...since I have four rings done. 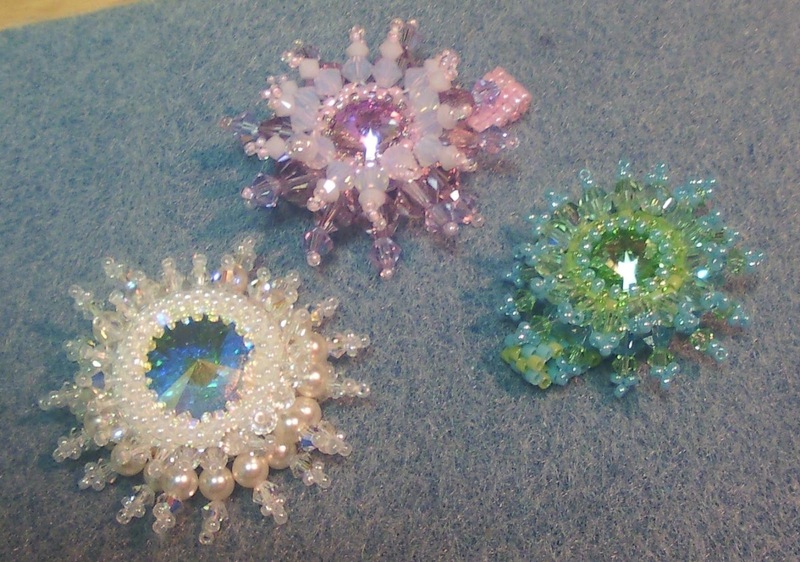 Aidan loves hers...and I talked about that yesterday... and these three are going to be in the mail to my pal soon. And as a treat for all of you too...I'll be drawing to give away a copy of Laura McCabe's book that was mentioned yesterday...compliments of Ms. Eileene! 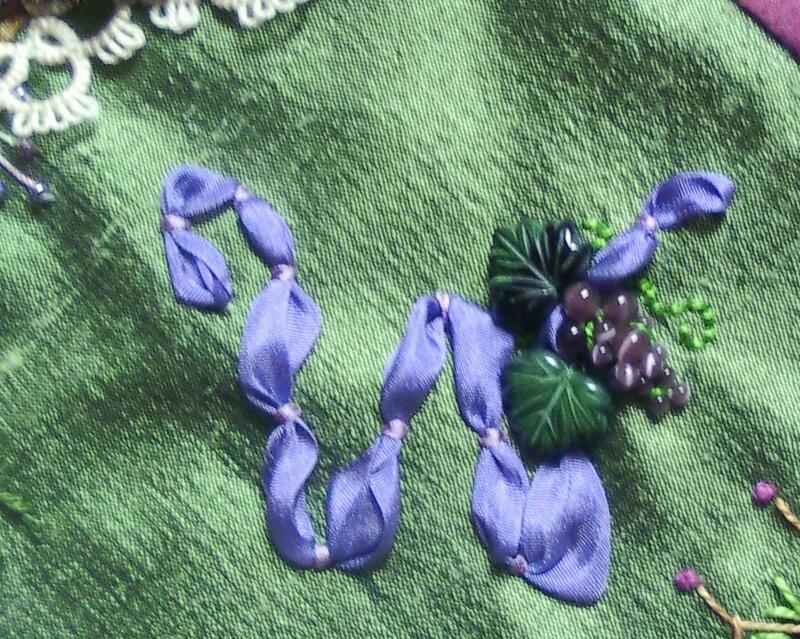 so just leave a comment and tell me what your favorite type of bead is. I have to be able to contact the winner...so make sure your profile includes your email address...or leave it on the comment. I'll close the drawing on Wednesday at midnight....my time! That 5/16/2012...midnight central time zone. This one will go to Aidan...as a present for her completing the second grade with such good grades...and only two trips to the principals office all year! Ha!I'm sure it will mostly get to live in her jewelry box...but, that's okay. 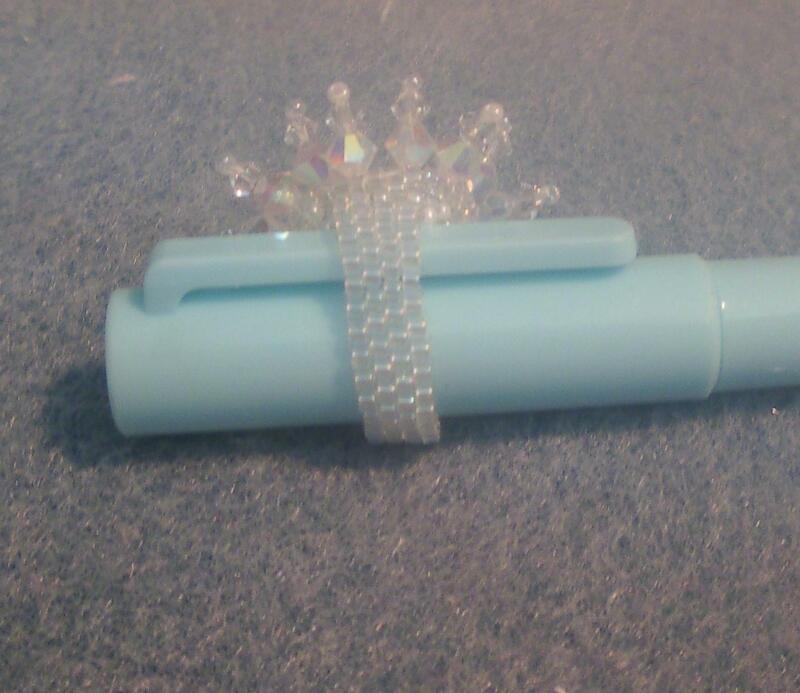 The band is beaded as well as the front.Oh, the book is Creating Crystal Jewelry with Swarovski by Laura McCabe if you want to check it out! 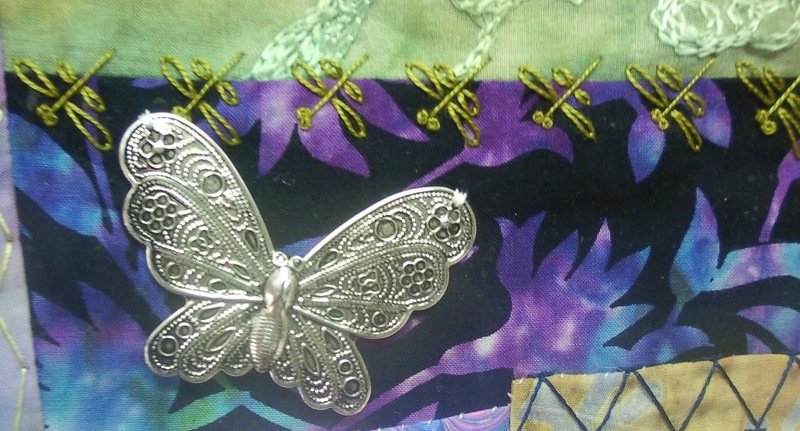 My muse is happy...and I'm going back to stitching something tomorrow...not sure what yet, my list is long...but something will have to get done.....before I start stressing over deadlines. Hugs!